Daljit Singh, a sewadar at gurdwara Jeewan Singh at Dashmesh Nagar of Kot Khalsa area was injured in an accidental blast inside the gurdwara premises in the afternoon today. No one was present at the gurdwara at the time of the blast thus averting a major accident. The police has booked Hardip Kaur, wife of Constable Paramjit Singh, who allegedly died under mysterious circumstances on July 10 last year. The police has arrested five persons in as many cases for alleged possession of narcotic powder. The police has also seized one kg of narcotic powder from the possession of the accused. Residents of several areas in the city complain of the shortage of domestic LPG cylinders. Limited supply and rise in the use of LPG due to the cold weather conditions and diversion of domestic to commercial are said to be the reasons behind the scarcity. The health department has seized habit-forming drugs from a medical store in Ajnala. The drugs include 700 tablets, 70 syrups and 1,800 capsules. The raids were conducted at various medical stores near the government Civil Hospital in Ajnala. Drug Inspector Bableen Kaur said the drugs were seized from KC Medical Hall. The purse of a student of BBK DAV College was allegedly snatched last evening when the victim was coming back from her college at Lawrence Road. The victim, identified as Chaaru Mahajan, a resident of Rani Di Haweli, Katra Baghian, had Rs 35,000 cash in her purse besides a mobile phone. She told the police that she was carrying the cash for her college fees. Availability of accomplished artisans coupled with astronomical rise in the prices of gold, the holy city is fast becoming a hub of imitation jewellery industry. Deputy Commissioner has formed new grievances committees for addressing the problems of the elderly. With the identification of ten multiple drug resistant tuberculosis (MDR-TB) patients in the district, the District Tuberculosis Hospital is ready to initiate direct observation treatment (DOTS) plus strategy. India must emulate China in developing sports infrastructure to shine in the field of sports at the global level, feel academicians and scholars. These views were expressed by the speakers, who presented their papers on the concluding day of the UGC-sponsored national seminar on ‘Futuristic Trends in Physical Education and Sports’ here today. Various NGOs today have come forward to revive the tradition of holding baby and flower show in memory of the renowned poet Bhai Veer Singh. They have decided to organise ‘Gul Gulshan Gulfam’, a flower show, at the Company Bagh on February 25 and 26. Many educational institutes and NGOs commemorated International Mother Language Day by organising seminars here yesterday. Polio drops were administered to more than 3 lakh children in the entire district during the three-day polio immunisation drive that concluded yesterday. Fine Arts Department of BBK DAV College for Women today organised two-day art exhibition ‘Kala Utsav’ at its campus. College principal Dr Neelam Kamra inaugurated the event. Postgraduate students of fine arts displayed their creative works based on Ragamala, Baramasa and Nayaka Nayika Bhedha, Raga Bhairava, Raga Hindola, Ragini Bhairaivi, traditional months of Shravan, Poush, Abhisarika Nayaika and Utka Nayika. Sri Guru Harkrishan Senior Secondary Public School, GT Road, in collaboration with Frank Brother Publishers held a workshop for primary and middle school English teachers at the school premises yesterday. About 50 teachers of various branches of the school attended the workshop. 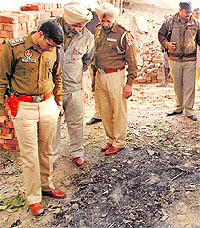 The police officials led by ACP (West) Kuldeep Singh visited the spot to carry out preliminary investigations. Daljit Singh used to collect dry tree waste at the spot and burnt it without knowing about the presence of any explosive material at the spot. As soon as he set the garbage on fire, a blast took place. The victim sustained injuries on his arm and legs, said Sukhwinder Singh, in-charge Kot Khalsa police chowki. He said though it seems that the blast occurred due to the presence of some explosives used in firecrackers, investigations are on to ascertain the exact cause of the incident. Daljit Singh, a sewadar at gurdwara Jeewan Singh at Dashmesh Nagar of Kot Khalsa area was injured in an accidental blast outside the gurdwara. Daljit Singh used to collect dry leaves before burning them, without any knowledge about the presence of explosive material there. The case was registered after the police received the viscera report. The police had earlier initiated the proceedings under Section 174 of the CrPC. Now, a case under Section 302 IPC has been registered against Hardip. Jagga Singh, the father of the victim and the complainant in the case told the police that the accused had pressurised his son to leave the village and shift to the city. He also alleged that the accused gave some poisonous substance to his son by mixing it in the tea. The police said the medical report confirmed the presence of some poisonous material in his body. He said further investigations have been launched while no arrest has been made so far. Hardip Kaur, wife of constable Paramjit Singh booked for murder. Paramjit Singh was found dead at his residence on July 10 last year. The police had earlier initiated proceedings under Section 174 of CrPC. Jaskaran Singh and his brother Raj Karan, hailing from Ramdass village and a resident of Maqbool Road area, where he lives on rent, were arrested by the police for possessing 220 gram of narcotic powder each. Baldev Singh, investigating officer and in charge Rani Ka Bagh police chowki said both were arrested separately when they were trying to sell the same. He said a number of cases have been registered against them on similar charges. They were notorious drug peddlers and habitual offenders, he said. They themselves are hooked to drugs. Two separate cases under Section 22/61/85 of the NDPS Act have been registered against them at the Cantonment police station here. Meanwhile, the Amritsar rural police has arrested Navraj Singh of Mahal village and Kulwinder Singh of Padde village for allegedly possessing 150 grams and 350 grams of narcotic powder, respectively. Gurdev Singh of Ferozepur was also arrested by Beas police for alleged possession of 5 kg of Bhukki. Police officials said the accused who was caught near Chhapeyawali village drain used to sell the same in the village areas. The shortage of LPG gas cylinders and their alleged black marketing have left residents high and dry as consumers had to wait for at least 15-20 days for the refill. According to reports, a domestic LPG refill is being sold between Rs 550 and above in the black market by the people who are allegedly hand in glove with various gas agencies in the city while in case of any emergency the rates shoot up further. The use of household gas cylinders by commercial establishments has further aggravated the problem. Many commercial establishments, including rehriwalas and sweetmeat shops, use domestic LPG cylinders. A wide gap between the rates of domestic and commercial LPG cylinders lures owners of these commercial units to flout the norms, sources say. A commercial LPG cylinder costs Rs 1,150 while a domestic cylinder costs Rs 420. Hence, the cost of a kilogram of commercial LPG is over Rs 52 whereas a domestic LPG is about Rs 30 per kg. A wide difference prompts commercial establishments to resort to black marketing of cylinders meant for domestic use and then use these in their shops. In the winter season, the demand of LPG increases manifolds. Household cylinders are also being used in four-wheelers, including cars, which has worsened the situation, said Surjit Sharma, a resident of Kashmir Avenue. A resident of Islamabad Vijay Kumar said cylinders were not available even after 20 days of booking them. He said it has forced them to look for alternate means of cooking like kerosene oil. 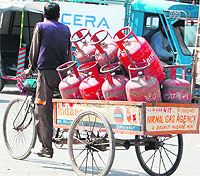 District Food and Supply Controller Dr Rakesh Kumar Singla said the city was facing a shortage of LPG cylinders. He said a 15-day backlog exists. He said as per the norms of the PSU companies 62 per cent of cylinders were being supplied against the demand of 1,000 to the district. He said come winter and the people switch over to LPG geysers. He said a close watch was being kept on commercial establishments to stop them from using domestic cylinders. He said 18 domestic cylinders were confiscated today while 40 had been taken in possession from various commercial establishments of the city last week. He said as per the norms the department did not return the held cylinders which led to a big loss for the shop as an empty LPG costs nearly Rs 3,000 in the market. He said the department was all set to intensify raids on commercial establishments. She said after seizing the drugs, a communiqué has been sent to the state drug controller to initiate legal action. She said the owner of the said shop could not produce a valid licence. As many as nine medical stores were inspected during the operation. She said as soon as she reached near Samsun Club while she was returning home, the motorcycle-borne youth came from behind and snatched her purse. The Civil Lines police has registered a case under Section 379-B, 34 IPC in this connection. Imitation jewellery made here, especially earrings and nose pins are a hit among customers all over the country. City-based manufacturers and traders supply the jewellery made here not only to various parts of the country and the district but also abroad. Artificial Jewellery Association secretary Satnam Singh Kanda said owing to a rise in the gold prices, more and more people are opting for imitation and gold-plated jewellery, which is why the sale of the jewellery has gone up significantly. Artificial jewellery, being locally manufactured at the hundred feet road and Sultanwind area, has become a cottage industry as thousands of families are involved in preparing them even in their houses. The jewellery also catches the fancy of people visiting Churreyan Wala Bazar and Main Sewa Da Bazaar in the periphery of the Golden Temple. Situated next to Guru Bazaar, traditional market of gold and silver ornaments, these markets have thrown alternatives to people to get gold look like ornaments at a low price. 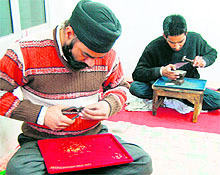 Kanda said the city is known for bulk production of imitation jewellery. The annual turnover of artificial jewellery items is estimated to be several crores of rupees. Artificial ornaments are sold not only in various domestic markets of the country but also in the world. “With rising prices of gold jewellery and decreasing profits, more and more jewellers have switched over to manufacturing and dealing with artificial jewellery,” said Gurinder Singh, one of the leading manufacturers and dealers in imitation jewellery. He said four kinds of artificial jewellery are available in the market. Gold-plated jewellery is the costliest of all as it uses gold foils to cover metals like copper and bronze. Another kind of artificial jewellery is antique, which is also very famous among customers, but it is prepared in West Bengal. Latest in the line is artificial jewellery prepared with chemicals. He said this latest technology has instantly captured the market for fishing out jewellery next to original. He said this kind of jewellery is prepared in Mumbai. He said gold, oxidised, antique ornaments even studded with kundan, polki, American diamonds and multi-coloured cut stones were being manufactured in the city. Certain houses are also exporting artificial jewellery to Canada, England and the Middle East. The merchandise looks so genuine and original that one can easily be fooled here, said a manufacturer Gurdeep Singh. The artificial jewellery is so beautifully crafted that it becomes difficult to differentiate between this jewellery and the original gold and diamond jewellery. “It is a jewellery of the middle class,” said Simrandeep Kaur, a resident of Puttalighar, who was purchasing artificial jewellery to match with her lehanga to be worn on the wedding of her brother. She said even wealthy people were wearing this jewellery to fool snatchers. This trade got momentum in the last few years. “With the rising prices of gold jewellery and decreasing profits, more and more jewellers have become inclined towards manufacturing artificial jewellery,” said another jeweller Arun Seth, alias Billa Seth, who is one of the main manufacturers and dealers in artificial jewellery. Most of the craftsmen manufacturing artificial jewellery are from Bengal, he said. The committee will have officials from the administration and the police department to solve the problems being faced by senior citizens. 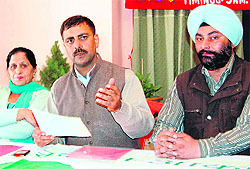 The committee will be headed by a sub-divisional magistrate at every sub-division level. He will also be accompanied by DSP or ACP during the meeting with elderly people to listen to their grievances. “The SDM and DSP concerned will hold meetings on the second and fourth Friday every month at the designated places from 11 am to noon to listen to their problems,” said Deputy Commissioner Rajat Agarwal. Their problems will be addressed on a priority basis, he added. “Now the presence of administrative and police official will save unnecessary delay in completing the formalities. Presence of the police officials will also act as a deterrent for their wards as strict legal action will be taken if they failed to fulfill their duties towards their parents,” said Agarwal. About 40 per cent of the complaints received by the administrative officials from the elderly are against their wards for either pushing them out of their house, ill treatment by the families or about property disputes. As per the Senior Citizens and Parents Welfare Act, earlier a SDM-level officer was designated as the appropriate authority to conduct the meeting with the elderly. The DOTS plus strategy was introduced in three districts namely Amritsar, Ludhiana and Patiala under the Revised National Tuberculosis Control Program (RNTCP) last year. So far the hospital was waiting for the reports that identify the patients who have developed resistance to the normal TB cure drugs. Forty-one sputum (saliva mixed with mucus) samples were sent to New Delhi for examinations by the hospital in November last. The hospital has received 36 reports so far and out of that ten reports show MDR TB symptoms. Chawla added that the MDR-TB patients are given free medicines, free investigation facility and two free meals a day. He said, “The free meals, sponsored by an NGO, are given as the patients come from far flung areas. Most of them are not economically well-off.” The treatment costs each MDR-TB patient Rs 3 lakh (appx) said Chawla. The TB hospital has constructed a special DOT plus ward and drug store for these patients. This year as many as 650 new cases of TB have been diagnosed under the Revised National TB Control Program. Last year, as many as 3,986 patients were treated under this program, said Chawla. He said more and more patients are coming forward to get themselves examined for TB because of the awareness campaign initiated under the project. India must emulate China in developing sports infrastructure to shine in the field of sports at the global level, feel academicians and scholars. These views were expressed by the speakers, who presented their papers on the concluding day of the UGC-sponsored national seminar on ‘Futuristic Trends in Physical Education and Sports’ here today. They said apart from infrastructure we should initiate a mass-movement to popularise sports culture in the country. More than 50 research papers were presented at the two-day seminar by experts from all over Punjab, Haryana, UP, Delhi and Chandigarh. The entire gamut of issues, including sports management, sports psychology, ethics in sports, the role of media, health medicine, science and sports, sports and business, political interference, corruption, gender equality in sports and food were discussed in detail. Academicians said China was nowhere in sports till three decades back but it rules the world in the sports arena today. “Before Los Angeles Olympics Games in 1984, China was nowhere in sight. But today the country dominates world sports’,” said Dr NS Maan, former head department of Physical Education, Panjab University, Chandigarh. Prof Gurbakash Singh Sandhu who chaired the academic sessions also said China has made sports as their mass-movement and unless we involve the general public from the grassroots level, we will not be able to compete with China in sports. 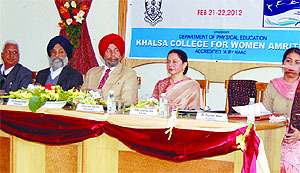 KCW principal Dr Sukhbir Kaur Mahal said the aim of the seminar was only to bring the best of the discussions on diverse topics concerning sports and physical education. She said more finances, public involvement, infrastructure building with more stadiums and sports ground has to be set up to give a boost to sports. She also advocated involvement of more women into the field of sports as they have tremendous spirit to compete. Dr Kanwaljeet Singh, director, Sports, Guru Nanak Dev University (GNDU) also emphasised on rooting out the ills, including drugs and corruption from sports. College sports in-charge Dr Tejinder Kaur gave the concluding remarks and thanked the speakers while Dr Mahal gave a mementoes to the guest speakers. Till 1999, the Amritsar Municipal Corporation organised flower show every year on December 5, the birth anniversary of the legendary poet. The others NGOs and organisations involved in the endeavour include India Against Corruption, Axshya Project for Control on TB, Sai Creations, Savera, Jagriti Bhalai Kendra and Civil Defense. Gurbhej Singh said the show is open for all residents, flower growers, nurseries, schools and colleges. He said the baby show will be held for the children between the age group of 2 to 5 years. The School of Punjabi Studies of Guru Nanak Dev University organised a Dr Paramjit Singh Walia Memorial Lecture. Punjab University Regional Centre, Sri Mukatsar Sahib; Director, Prof Paramjit Singh Dhindsa delivered this lecture while Dr Paramjit Singh Sidhu, former head of the department, presided over. Prof Dhindsa in his lecture detailed about the development of the Punjabi literature and its history. 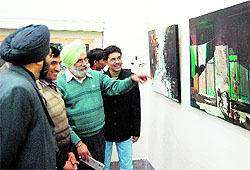 He said in spite of many efforts, the language has not yet got the desired status.A poster exhibition was also organised by the students to mark the occasion. Kendari Punjabi Lekhak Sabha, Janwadi Lekhak Sangh, Folklore Research Academy and Tarksheel Society in collaboration with Punjabi department of SR Government College for Women held a seminar. Among others S Purshottam, Ramesh Yadav, Dr Gurnam Kaur Bedi and Punjabi writers Talwinder Singh and Davinder Singh were present. On the third day of the drive, the teams of volunteers and health employees administered polio drops to 66,025 children. He said the department had targeted 3,37,420 to be covered in the three-day campaign, however they managed to administer polio drops to 3,54,953 children. He also said they were satisfied with the results. On the first day of the drive, around 1,87,864 children were given polio drops. On the second day of the drive 1,01,064 children in the district were administered the drops. Randhawa said the polio immunisation teams have put in hard work to make this drive a success. Resource persons Neelam Kapoor and Nisha Kapoor discussed various changes taken place in English text books for Class V to VIII. They also discussed techniques to be adopted in classroom to improve teacher-student relationship. The teachers were divided into groups and each group performed a different teaching technique. The observers for the occasion were principals of various Sri Guru Harkrishan (SGH) Schools. Director SGH Schools Dr Dharam Veer Singh welcomed the resource persons. Ryan International School yesterday organised a flower show in its school premises to create awareness about green and clean environment. Host school students also prepared manure for. They distributed the manure in various places. School Headmistress Rajni Kalra said through the flower show the school reiterated its commitment to safeguard and improve its surroundings. She said students planted saplings around the school to ensure a greener landscape. She hoped that it would bring forth creativity, innovativeness and brilliance among the students.